Shannon Campbell is a scientist and a small business owner. Based in Boulder, Colo., she is passionate about health and medical technologies. She holds a bachelor’s degree in human biology and biochemistry from the University of Guelph, and a PhD in human physiology from the University of Melbourne. Carbon dioxide, a byproduct of metabolism, is carried in the blood to the lungs, where it is exhaled into the atmosphere. A high level of carbon dioxide in the blood, called hypercapnia, is usually accompanied by an increase in breathing to help return levels to normal. Acute, or short-term, hypercapnia is generally caused by respiratory failure or diminished gas exchange in the lungs. Chronic hypercapnia is associated with lung diseases, such as emphysema or chronic obstructive pulmonary disease (COPD). Hypoventilation describes breathing that is too slow or shallow. This leads to less carbon dioxide being exhaled and a resultant buildup in the blood. In healthy people, this is quickly resolved by a strong desire to breathe more frequently. However, certain conditions can decrease the normal drive to breathe or prevent normal ventilation, resulting in acute hypercapnia. Central nervous system problems -- such as unconsciousness, sleep apnea or drug overdoses -- are common causes of hypoventilation. Lung diseases like asthma or COPD can cause airway blockages that may also lead to short-term hypoventilation. Injuries to the ribs or muscles associated with breathing can also lead to hypoventilation due to fatigue or pain during respiration. To exhale carbon dioxide into the atmosphere, it must first be extracted from the blood in the lungs. This process is called gas exchange and depends on careful matching of blood flow to the active air sacs. Pulmonary edema -- fluid in the lungs -- or other lung injuries can diminish gas exchange and result in acute hypercapnia. Production of carbon dioxide sometimes can be too high to be completely exchanged in the lungs, also resulting in hypercapnia. This is usually seen in people on ventilators, where the rate and depth of breathing are mechanically controlled. Exposure to high levels of carbon dioxide in the air can be another cause of acute hypercapnia. Elevated levels of carbon dioxide in inhaled air make gas exchange difficult and result in accumulation of carbon dioxide in the blood. The exposure may be caused by atmospheric conditions, such as pollution or volcanic gases. Rebreathing exhaled air due to poor ventilation or scuba equipment malfunction can also lead to acute hypercapnia. The best solution for any of these situations is to move to a well-ventilated area where normal breathing is possible. Chronic hypercapnia occurs over days or weeks. In diseases such as emphysema, the lungs are no longer capable of effective gas exchange and the mechanisms that would normally help manage and adjust blood carbon dioxide levels are no longer as effective. 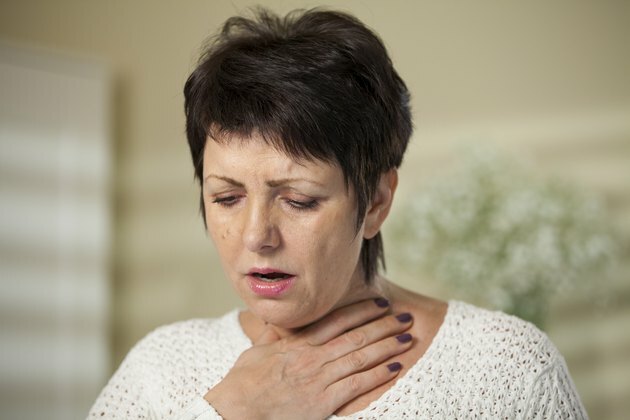 Chronic hypercapnia can be caused by other problems in the body, including persistent vomiting, seizures, dehydration and taking antacids or other drugs or foods containing bicarbonate. Heart, kidney or liver diseases and some adrenal disorders also can lead to chronic hypercapnia. Severe hypercapnia is often a sign of respiratory failure. Shortness of breath is the predominant symptom. This is often accompanied by sweating and anxiety. Seek emergency medical attention if you have difficulty breathing or cannot catch your breath, especially if you have existing lung disease such as asthma or COPD. A high carbon dioxide level that develops gradually may cause more subtle, slowly progressive symptoms such as confusion or decreased mental alertness. Contact your doctor right away if you have lung disease and notice these symptoms as they may indicate deterioration in your condition.